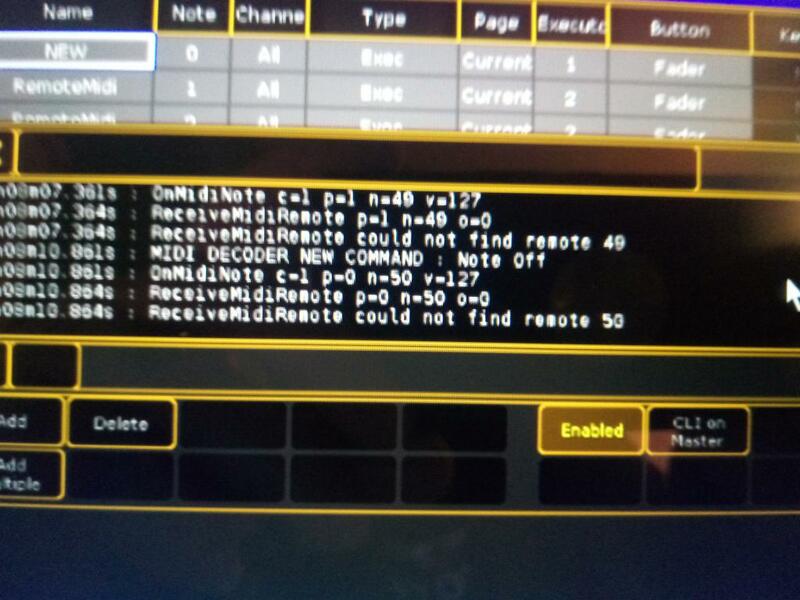 tried something with Ableton live 10 lite with bome pro but buttons on every faders gives the same note..
48.49 50 each button faders..so I need to insert new note on each button tried with bome but nothing..
Hi, did my answer help? If not, let me know where you are. thanks will try in that way..
here’s a pic of what I have..
Hm interesting. and which button are you calling button 1? I assume you are trying to control PAN LED. The solution I originally gave was for the 40 matrix clip launch LED’s. they only work as a flash button..but at least they work..
Are you sure you have a MKII? I disabled the translator that covered LED feedback for all 40 Matrix buttons. I added another translator for just 2 buttons and showed examples of toggling just the two. I used global variable ga for button 1 and gb for button 2. The preset is set up just to accept input and feedback to your APC40MK2. For any other button you will need to create a new global variable. Each button must have its own global variable in this methodology. I did not use bit mapping since it seemed to confuse you which is why I disabled the other preset. hello Steve thank u for the ready answer..
but I did’nt get the way to switch on and off the buttons..
they’r still in on mode if u could configurate 3 or 4 then I could copy them and doing on my own.. Under the INIT preset I added a translator to set global variable when the timer Init triggers. I use bitmaps to reduce the amount of global variables used. I could have used 40 separate global variables instead but in this case since I bit mapped the buttons I only used 2 global variables. A variable holds 32 bits and we have 40 total to work with so it needed 2. I also set up ga as a counter which is used later to refresh the LED’s (counting down from 39 to 0) which also serves as note numbers to send LED colors to. Then a created a new preset for LED feedback. I attached the input and output of this preset to the APC40 MK2 only since I don’t want the LED feedback also going to GMA2. In this preset, there are 2 translators. Note Matrix LED Update – This is the timer that iterates through each note and sets the color state of your controller depending on the bit state of its LED. This is where the On and Off colors are defined. It basically looks at the bit state of the LED and sends either On color or Off color depending on the state. If you want to change the on and off colors, this is where you would do that. I’ve attached the project file. I tested with my APC-MINI with colors 1 a 3 because it does not have as many colors as the APC-40 MKII. I looked at the below page to determine the colors. Hi, could you tell me the desired behavior you want with the central 40 buttons? Are you looking to toggle them each time they are pushed. Push once, note on, push again, note off? 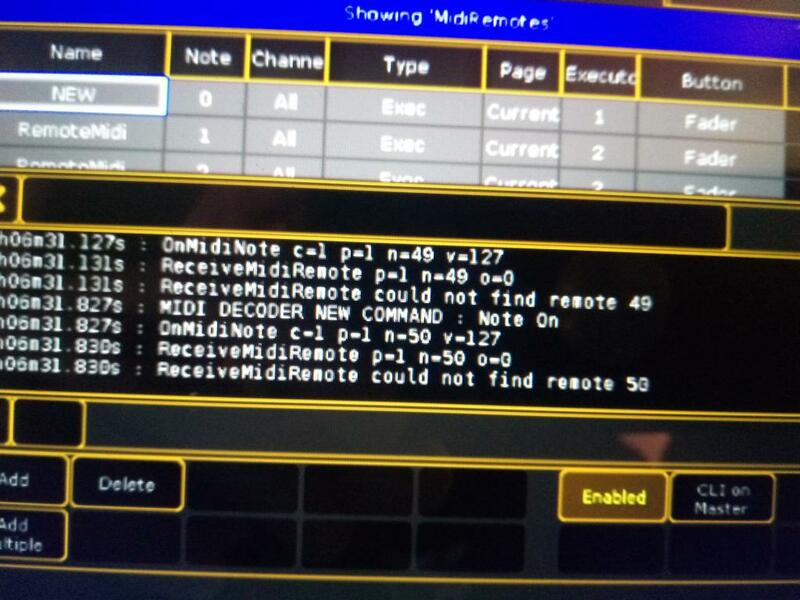 What color are you looking for for note-on and note off? Also some of these buttons you captured the Note-Off as the trigger and others Note-On as the trigger? For instance 90 17 7F (which is note-on) for button 38 and 80 1F 00 (which is note-off) for button 39. Are you expecting different behavior for some buttons than others? how can I insert different colour on buttons? 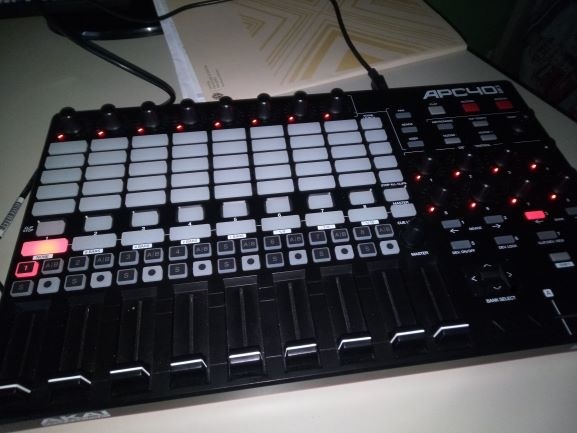 Got to tha Akaipro site and download the manual APC40 MKII protocol (or something like that) It provides information on all of the buttons’ MIDI Channels, values and color mapping. You will need to put the device into “momentary” mode if you want to control the colors and behavior of the buttons I remapped for you. Of course the color feedback to these buttons will need to be their original value (the value the button send) instead of the mapped value (the value that I programmed) for it to work. 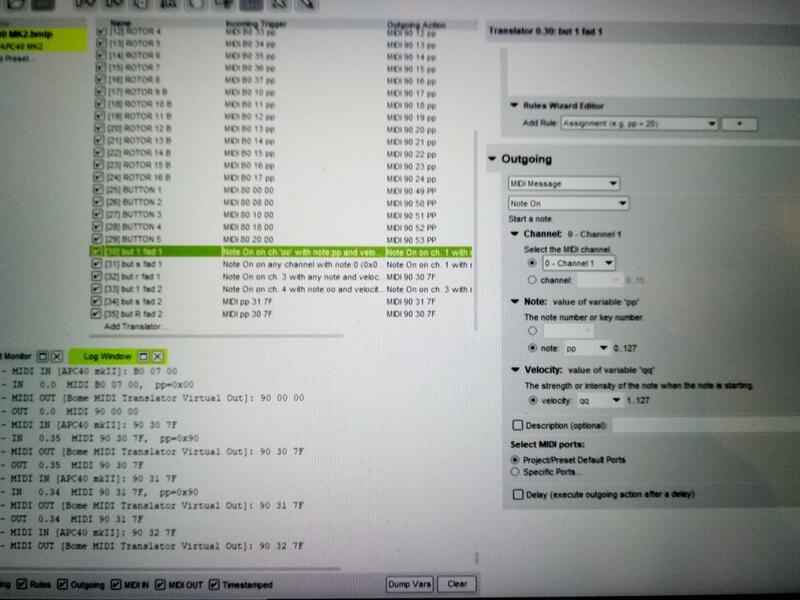 The mode options are in the rules of the translator I set up for Init APC40. 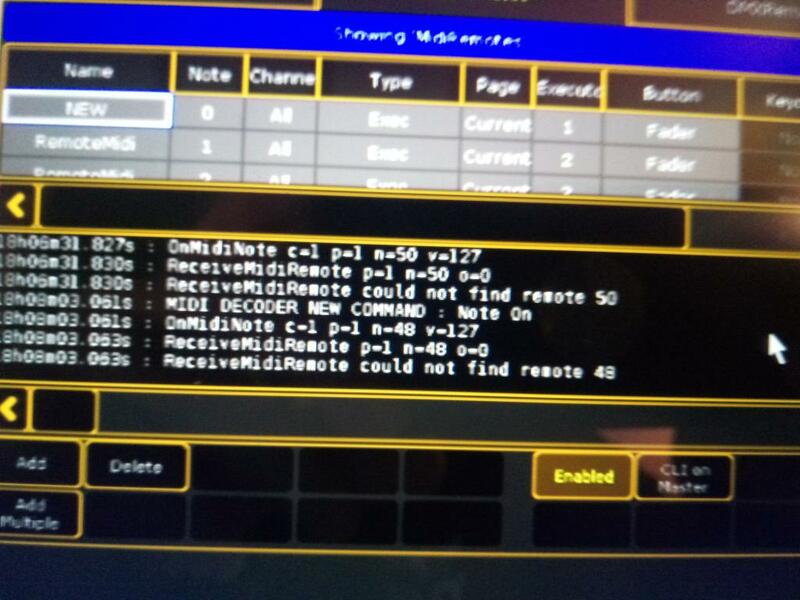 You would set up a new preset with output to APC40 only and then use Bome MT Pro rules and variables to control the colors you send back to the controller. The input of this preset would likely also be the APC40. If you have a single button example you need, please describe and I will assist with that, then you can build the rest of them yourself. If you want me to do more than one, send me an email and I can provide an estimate. Added Init Preset and set it to send Init string to your APC-40 at project start. I convert all of these from there respective channels and notes number to put out Notes on Channel 2 only. You will need to set GMA2 to recognize Channel 2 notes for these. 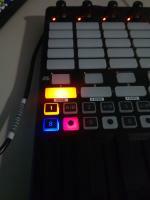 I did this so that the notes would not conflict with any other APC40-MK2 buttons. tried all the ways..but the result it’s always the same..
should I flag incoming and outgoing..? should I flag the incoming and outgoing window..? Could you please attach your project file (as an answer) here. I will edit it for you. Probably the quickest way. My original response was based on the note numbers of the main matrix and I suspect if you are using 48,49 and 50. Those are Record Arm, Solo and Activator. So basically the logic is correct, it is that we are just looking for the wrong notes. 2) On output, convert that to a unique note and channel so that GMA2 can handle it. Hello thanx for the ready reply.. When I insert new values how Can I Save ? I mean.. with the Classic version I click on apply what about the pro version..? Actually i did’nt have time to test .. Values are saved as you type them. There is not undo function so make sure you type correctly and even perhaps periodically save you project file. Hi, on the APC 40 MK2 button matrix, each button gives the same note number but on a different channel. 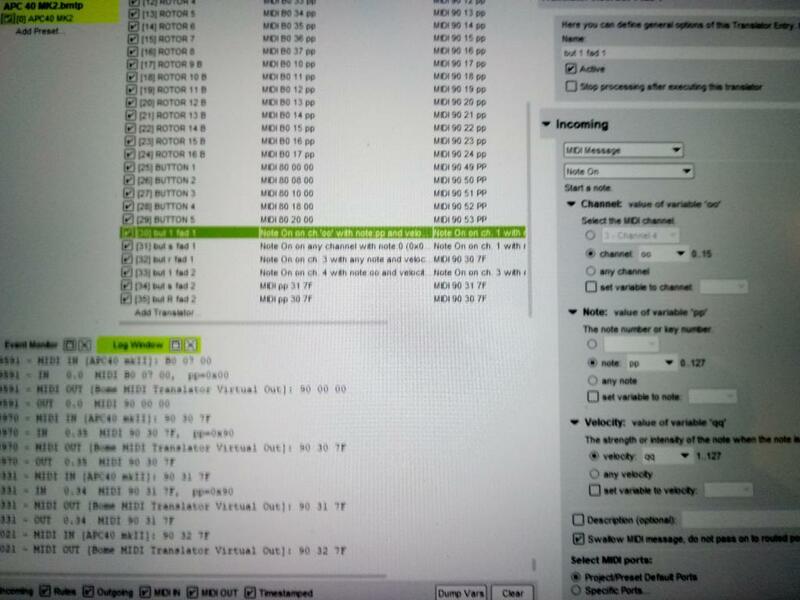 Column 1 sends on MIDI Channel 1, Column 2 sends on MIDI Channel 1 etc. 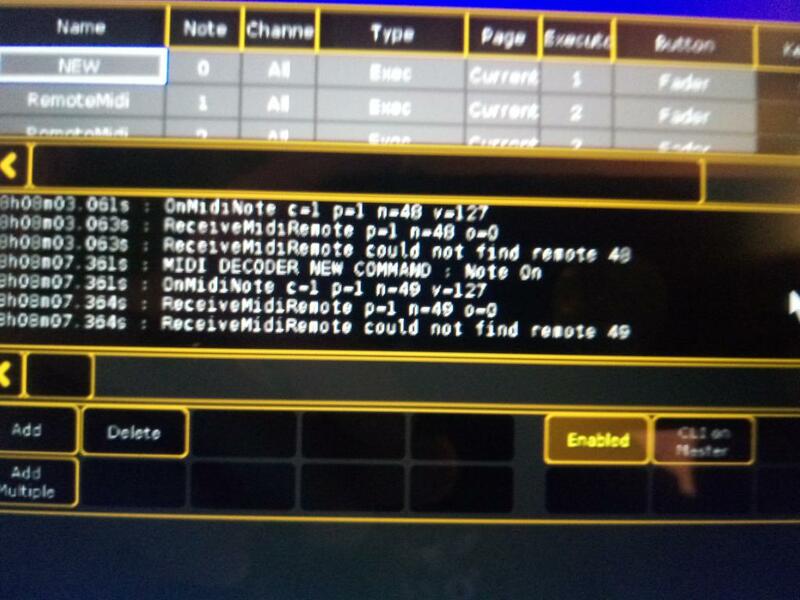 If GMA2 will not accept these messages as unique (same note different MIDI Channel), then it is possible you would need to remap your controller. I only tested this on paper so if there is something not working, let me know.